› Author Affiliations Funding The present project was financially supported by the intramural funding program “Ricerca Corrente” of the IRCCS Policlinico San Matteo Foundation: RC/80520 to M. Massa. 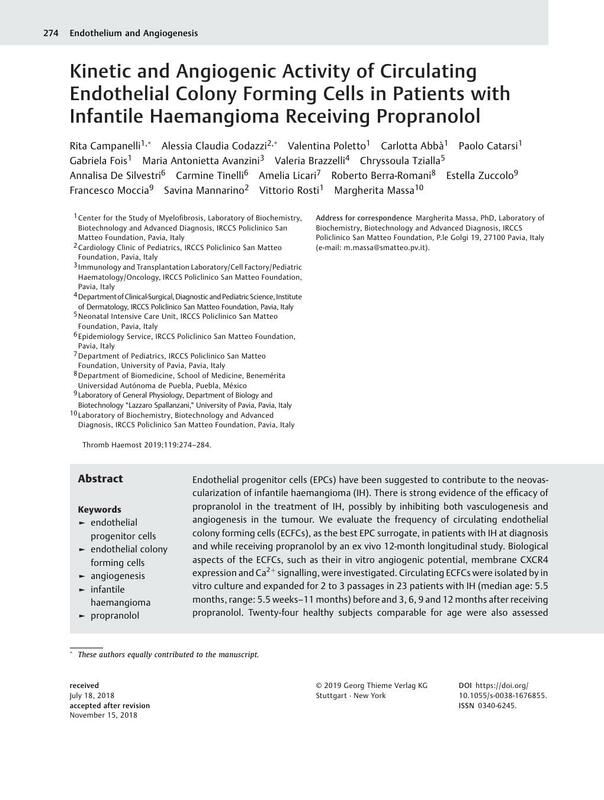 Endothelial progenitor cells (EPCs) have been suggested to contribute to the neovascularization of infantile haemangioma (IH). There is strong evidence of the efficacy of propranolol in the treatment of IH, possibly by inhibiting both vasculogenesis and angiogenesis in the tumour. We evaluate the frequency of circulating endothelial colony forming cells (ECFCs), as the best EPC surrogate, in patients with IH at diagnosis and while receiving propranolol by an ex vivo 12-month longitudinal study. Biological aspects of the ECFCs, such as their in vitro angiogenic potential, membrane CXCR4 expression and Ca2+ signalling, were investigated. Circulating ECFCs were isolated by in vitro culture and expanded for 2 to 3 passages in 23 patients with IH (median age: 5.5 months, range: 5.5 weeks–11 months) before and 3, 6, 9 and 12 months after receiving propranolol. Twenty-four healthy subjects comparable for age were also assessed (CTRLs). Untreated patients with IH had a circulating ECFC frequency lower (p = 0.001) than CTRLs; nevertheless, in in vitro starving conditions, ECFCs showed enhanced capacity to form tube-like structures than those of CTRLs. Patients with IH following the therapy with propranolol had a significantly increased (p = 0.022) circulating ECFC frequency, that showed a diminished tube-like formation capacity in vitro, and an altered constitutive store-operated Ca2+ entry. ECFCs play a role in IH pathogenesis; the response to propranolol therapy is associated with their increased frequency in the peripheral blood and a reduction of their vasculogenic activity. * These authors equally contributed to the manuscript.